Agent Booth and Dr. Brennan in the September 24, 2012 episode of Bones. Gotta love them together. 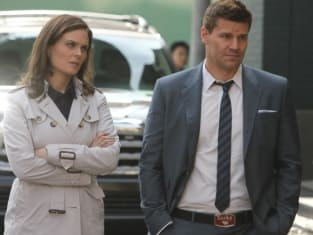 Booth and Brennan in a shot from the September 24, 2012 episode of Bones. Don't Step in the Brain! Booth steps in the brain in this photo from "The Partners in the Divorce." Gross. 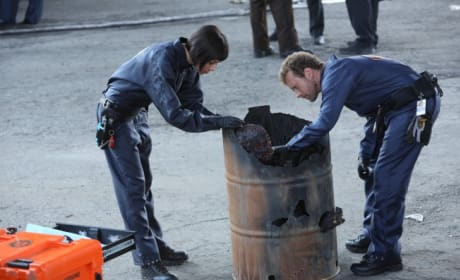 Hodgins and Cam in the September 24, 2012 episode of Bones. "The Partners in the Divorce" begins with a body recovered in a barrel. Bones Review: You Slept Under a Bridge? 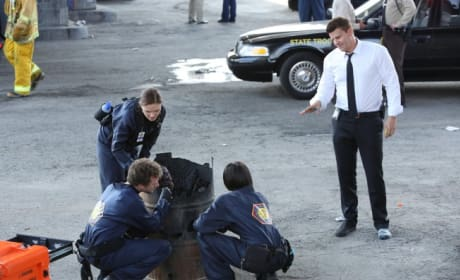 Bones Promo: Don't Step in the Brain!